Most of us attempt to live our lives in reverse. We want to have more things and more money, in order to have the freedom to do what we want and consequently be happier. I’ve learned that we first have to find out who we are really are and do what we need to do to have what we really want. We are all here for a purpose and it’s so important that we strive to find out what that is. It is important that we take the time to create a vision for the way we want our lives to be. And if we are honest with ourselves and listen to our intuition we will find our vision. In his book, Leadership From the Inside Out, Kevin Cashman relates the tale of a priest, who was confronted by a soldier while he was walking down a road in pre-revolutionary Russia. I love this story. These three simple questions deserve thought and if we are committed to answering them, we will find our vision. Over the next few days keep asking yourself these 3 questions. Note down the answers you get. Discern how authenic they are. Write them down. Ask them again. Revise your answers if need be. This is an important process. Your answers might surprise you. 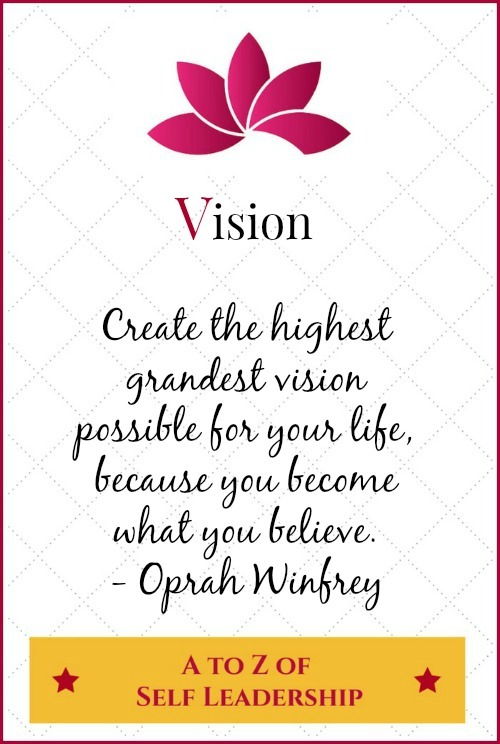 There other ways like creating a vision board, for example, to help you find your vision. Believe me, it’s so worth an investment of your time and effort to find your vision. Once you’ve found it, hold on to our vision and make it your reality. Today I’m on ‘V’ of the Blogging from A to Z April Challenge. My theme is the A to Z of Self Leadership. I’m also undertaking the NaBloPoMo for April – the theme is ‘grow’ and the Ultimate Blog Challenge.